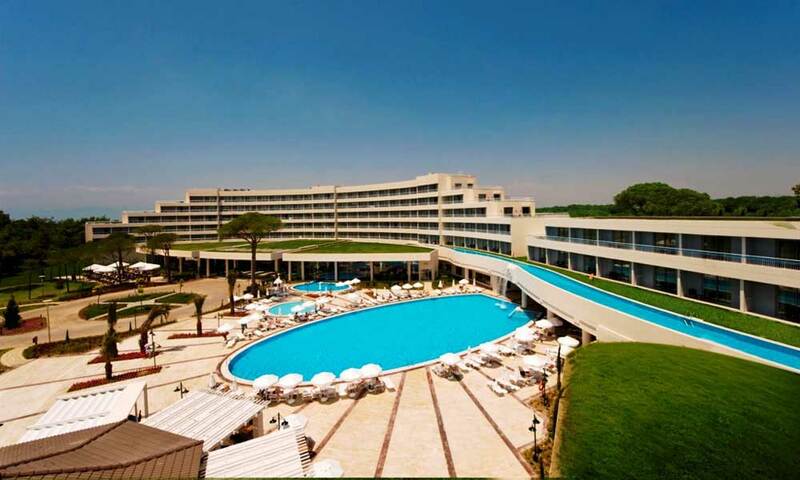 SENTIDO Zeynep Golf Resort is a place where people dream of The comfort in two different building with the sea, as blue as the sky, the infinite vastness of the scenery, the hot sun and natural beauty of the south are united here. The hotel facility, which is enwrapped in magnificent pine trees, is situated at sea level. Its beautiful location next to the sea and openly landscaped garden invites you to rest and relax. Enjoy the unique scenery and elegance combined with warmest Turkish hospitality. One of the building just next to the beach and another building is just next to Carya Golf Club. 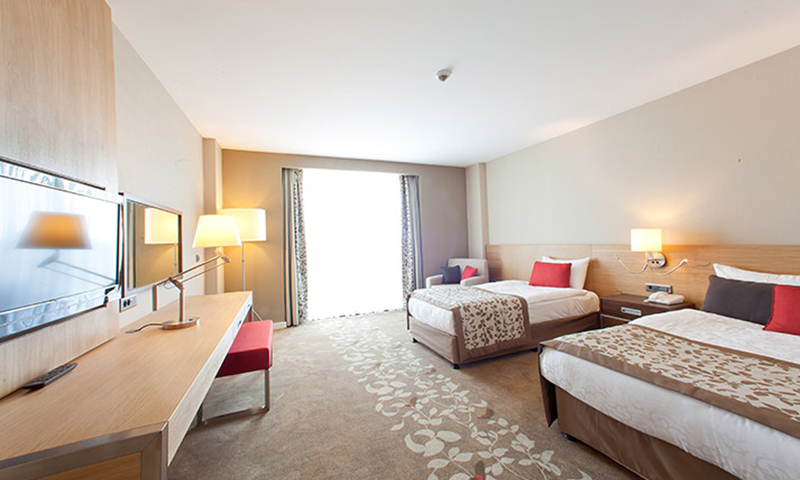 Located in the main building, the Standard Room accommodates up to 4 guests. With a breathtaking view of the garden, the room features a balcony, queen size bed or two twin beds, bathroom, shower and mini bar. An additional bed and baby cot are also available. 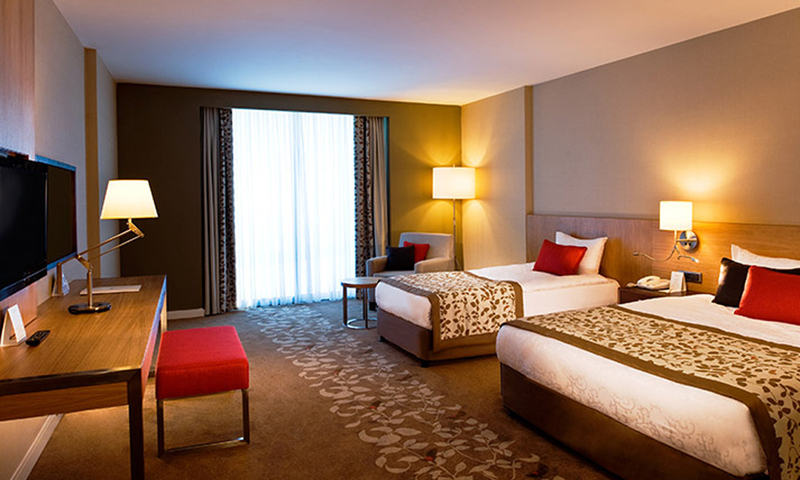 The Standard Room features a direct dial telephone, satellite TV and music broadcast, complimentary WIFI, carpet floors, central air conditioning, safe box, hair dryer and cosmetic mirror. Bathrobes and slippers are also provided to guests. 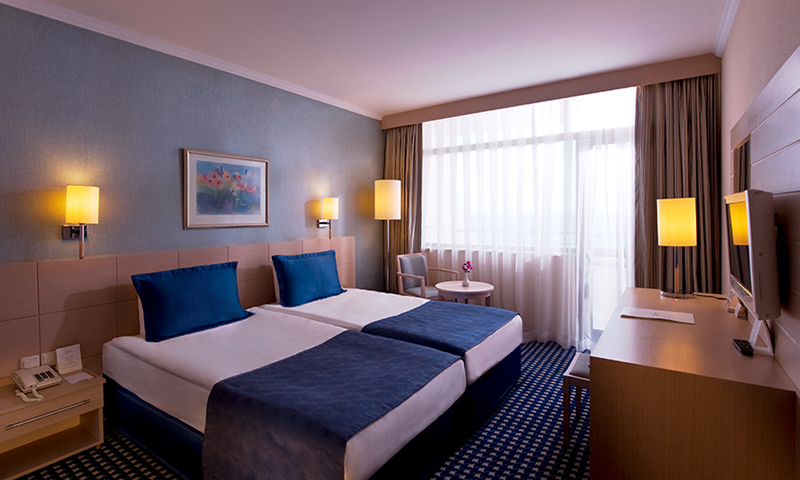 Located in the main building, the Superior Room accommodates up to 4 guests. With a breathtaking view of the garden, the room features a balcony, queen size bed or two twin beds, bathroom, bathtub, shower and mini bar. An additional bed and baby cot are also available. The Duplex Lake Suite accommodates up to 4 adults. With a breathtaking view overlooking the garden, the Duplex Lake Suite features two bedrooms, bathroom (with shower and bathtub), a balcony and spacious terrace. An additional bed, baby cot, connecting door, coffee/tea station and mini bar is also featured. Direct access to the pool is a particularly desirable addition to this süite. The Duplex Lake Suite features a direct dial telephone, satellite TV and music broadcast, complimentary WIFI, carpet floors, central air conditioning, safe box, hair dryer and cosmetic mirror. Bathrobes and slippers are also provided to guests. The Champion Suite is the largest suite at the resort, accommodating up to 4 adults. This superb suite features two bedrooms (duplex), bathroom, shower and bathtub. The Championship Suite overlooks the breathtaking garden, with both a balcony and spacious terrace to enjoy the view and fresh air. The suite also has direct access to the pool, a connecting door, coffee/tea station and mini bar. The Championship Suite features a direct dial telephone, satellite TV and music broadcast, complimentary WIFI, carpet floors, central air conditioning, safe box, hair dryer and cosmetic mirror. Bathrobes and slippers are also provided to guests. The resort’s two Honeymoon Suites are ideal for newlyweds and couples seeking a romantic holiday experience together in Belek, Antalya. With a balcony overlooking the breathtaking garden, the Honeymoon Suite features a queen size bed, bathroom, shower and jacuzzi. An additional bed is also available. A mini bar and coffee/tea station is featured in the suite. The Honeymoon Suite features a direct dial telephone, satellite TV and music broadcast, complimentary WIFI, carpet floors, central air conditioning, safe box, hair dryer and cosmetic mirror. Bathrobes and slippers are also provided to guests. 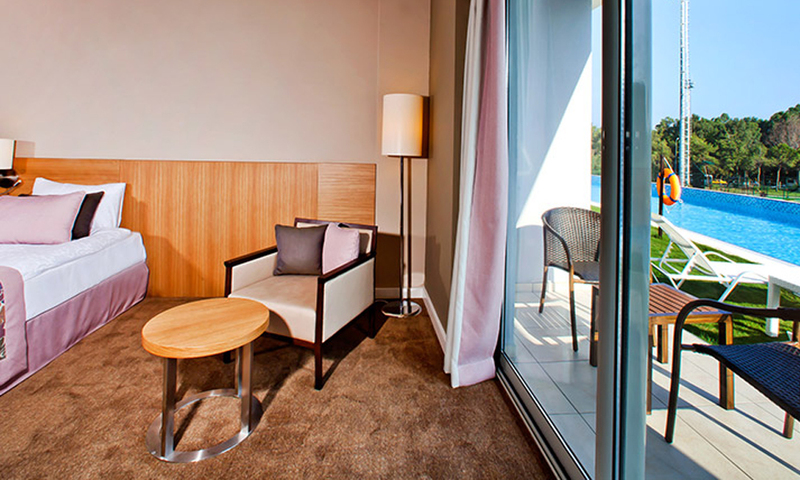 The Terrace Suite designed to accommodate 2 adult guests, an ideal choice for couples travelling together. With a breathtaking view of the garden, the Terrace Suite features a balcony in addition to a spacious terrace, bedroom (queen size bed), bathroom, shower and jacuzzi. An additional bed, baby cot, coffee/tea station and mini bar is also featured. Located in the main building, the Standard Room Land View overlooks the resort’s breathtaking natural landscape, accommodating up to 2 adults and 1 child. 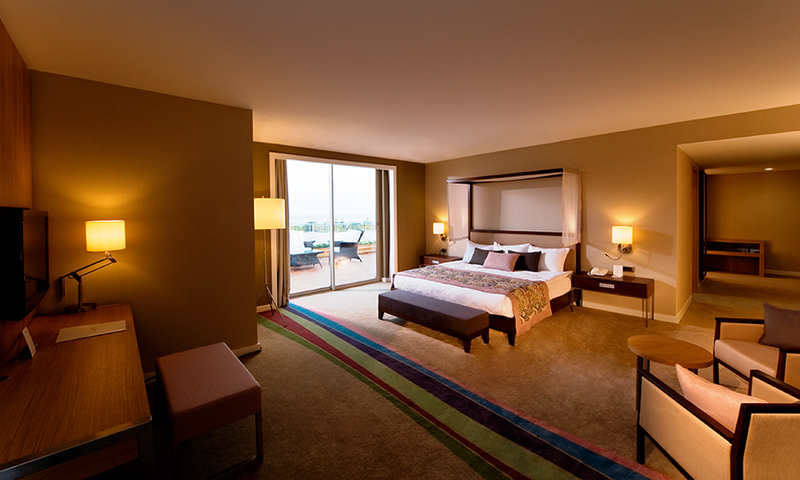 The Standard Room features a spacious balcony, bathroom, shower, additional bed and mini bar. The Standard Room also features a direct dial telephone, satellite TV and music broadcast, complimentary WIFI, carpet floors, central air conditioning, safe box, hair dryer, cosmetic mirror and slippers. 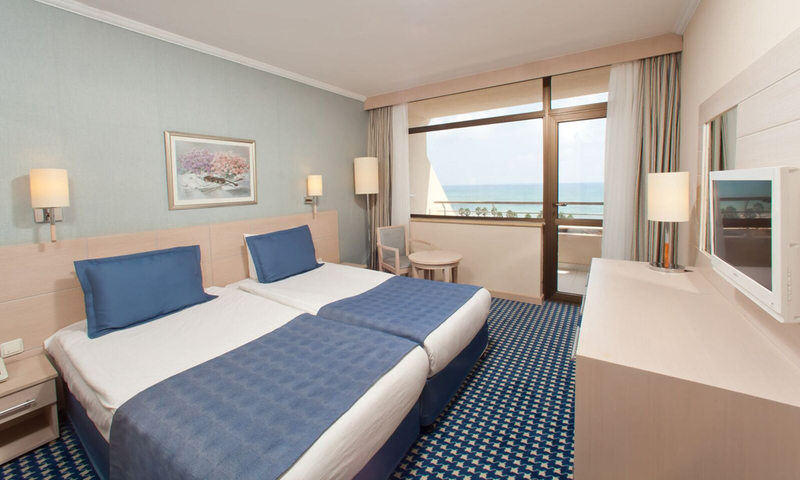 Located in the resort’s main building, the Standard Room Sea View overlooks the breathtaking Mediterranean Sea, accommodating up to 2 adults and 1 child. The Standard Room features a spacious balcony, bathroom, shower, additional bed and mini bar. The Bungalow Standard Room Land View can accommodate up to 4 guests. Featuring a spacious balcony overlooking the resort’s beautiful natural landscape, the Bungalow Standard Room Land View includes a bathroom, shower, additional bed and mini bar. Complete with wooden floors, the Bungalow Standard Room Land View features a direct dial telephone, satellite TV and music broadcast, complimentary WIFI, central air conditioning, safe box, hair dryer, cosmetic mirror and slippers. The Bungalow Standard Room Sea View can accommodate up to 4 guests. Featuring a spacious balcony overlooking the breathtaking Mediterranean Sea, the Bungalow Standard Room Sea View includes a bathroom, shower, additional bed and mini bar. Complete with wooden floors, the Bungalow Standard Room Sea View features a direct dial telephone, satellite TV and music broadcast, complimentary WIFI, central air conditioning, safe box, hair dryer, cosmetic mirror and slippers. Located in the main building, the Family Suite overlooks the resort’s breathtaking natural landscape, accommodating 3 adults and 1 child comfortably. 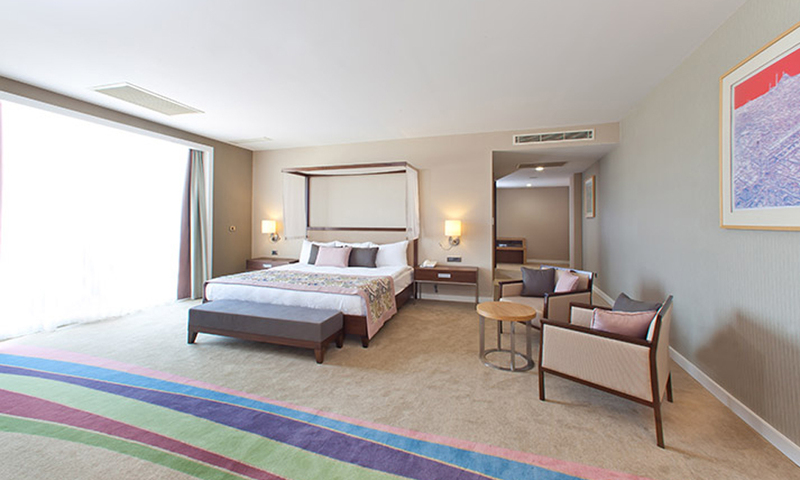 The Family Suite features 2 bedrooms, bathroom, shower, connecting door and additional bed. A mini bar and coffee/tea station is also included. The main building’s Family Suite also features a direct dial telephone, satellite TV and music broadcast, complimentary WIFI, carpet floors, central air conditioning, safe box, hair dryer, cosmetic mirror and slippers. 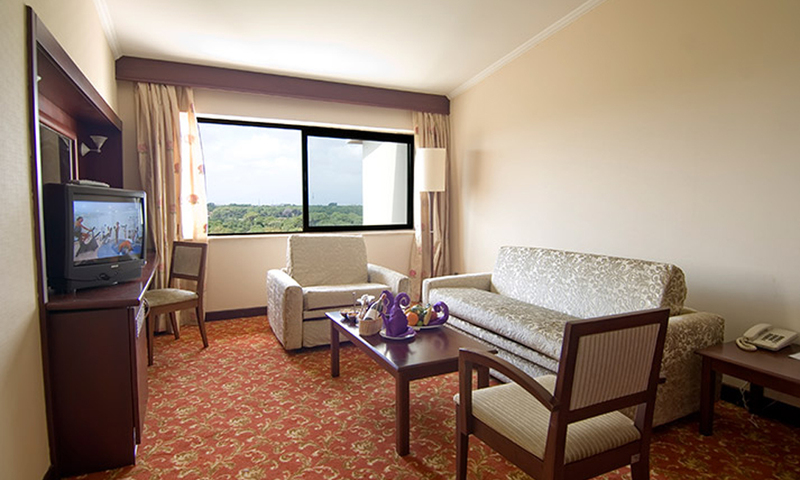 The Executive Suite overlooks the resort’s breathtaking natural landscape, accommodating up to 4 guests. Half of our Executive Suites feature a balcony. The Executive Suite features 2 bedrooms, a spacious living room, bathroom . (with shower and jacuzzi), connecting door and additional bed. A mini bar and coffee/tea station is also included. The Executive Suite features a direct dial telephone, satellite TV and music broadcast, complimentary WIFI, carpet floors, central air conditioning, safe box, hair dryer, cosmetic mirror and slippers. The Family House features 3 bedrooms and accommodates up to 5 adults. It’s spacious terrace allows guests to enjoy the spectacular view of the resort’s breathtaking natural landscape. The Family House features 3 bedrooms, a spacious living room, bathroom (with shower and bathtub) and connecting door. A mini bar and coffee/tea station is also included. Complete with wooden floors, the Family House features a direct dial telephone, satellite TV and music broadcast, complimentary WIFI, split air conditioning, safe box, hair dryer, cosmetic mirror and slippers. Start the day with a breakfast with a large number of choices which will not leave any of your desires unfulfilled. We present you 5 exclusive A‘la Carte Restaurants: Mediterranean (with charge), French (with charge), Mexican (with charge), Italian and Chinese. You can find flavours from traditional Turkish cuisine, to original Italian and international Fusion Cuisine. 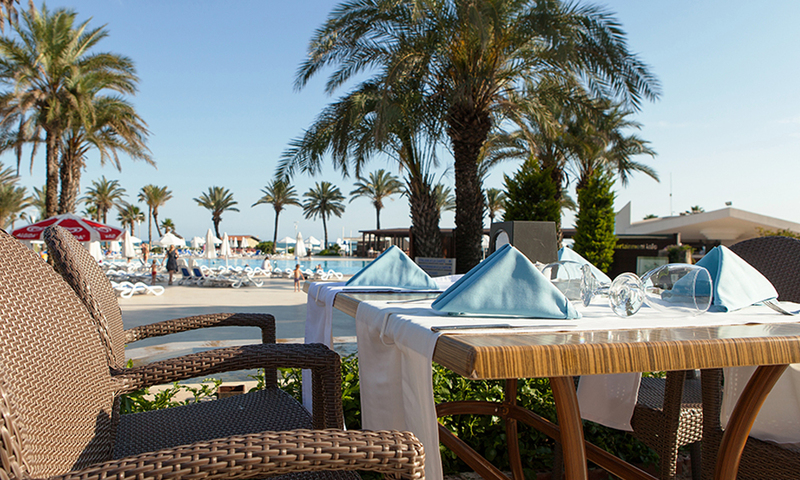 Snack restaurant offers you snacks at the pool side and on the beach, between courses. Enjoy drinks and cocktails at our varied bars. 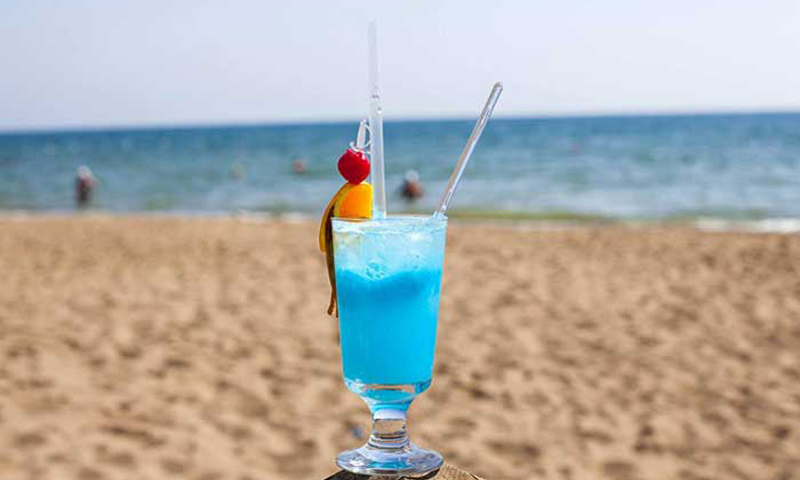 The Lobby, Pool and Beach Bar and Sixth Sense Disco Bar will all be happy to serve you. Our professional team of animators entertains you with varied activities throughout the day. After the sun sets, our showmen and women take the stage for you, wearing magnificant costumes. Perfect dance shows and musicals will excite you. Or you can wait for the day to end with a cocktail at one of our bars or at the disco. Release your energy! Zeynep Hotel fulfills all the desires of sports lovers: Fitness, Aerobics, Basketball, Beach-Voleyball, Mini-Football, Archery, 6 tennis courts, and more. 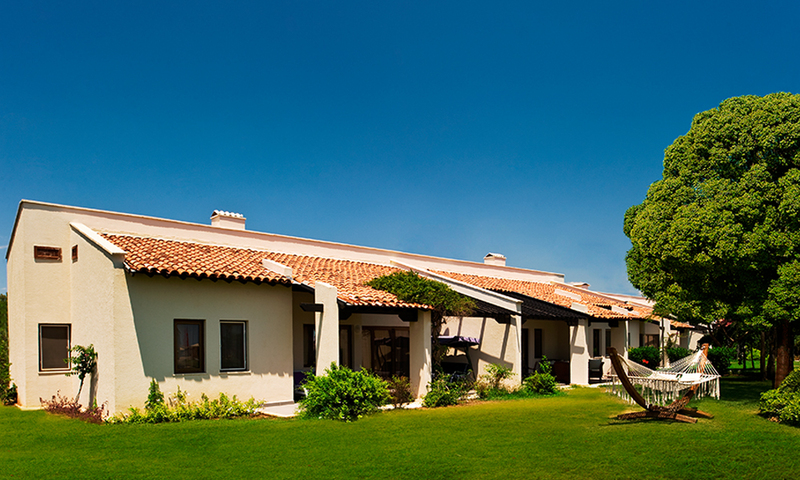 Golf lovers can realise their desires at the neighbouring Carya Golf Club. At the same time, you may also use our very varied water sports capabilities. For instance, canoeing, wind-surfing, water-skiing or sailing on a catamaran. You can swim in our new 1.200m² Olympic pool. Experience the joys of a relaxing family holiday. We have thought of everything so that our children may enjoy an unforgettable holiday. In the Mini Club, which we have re-structured to meet needs, our children can play games with trained carers, join activities, or cut loose – no limits have been placed on fantasies.